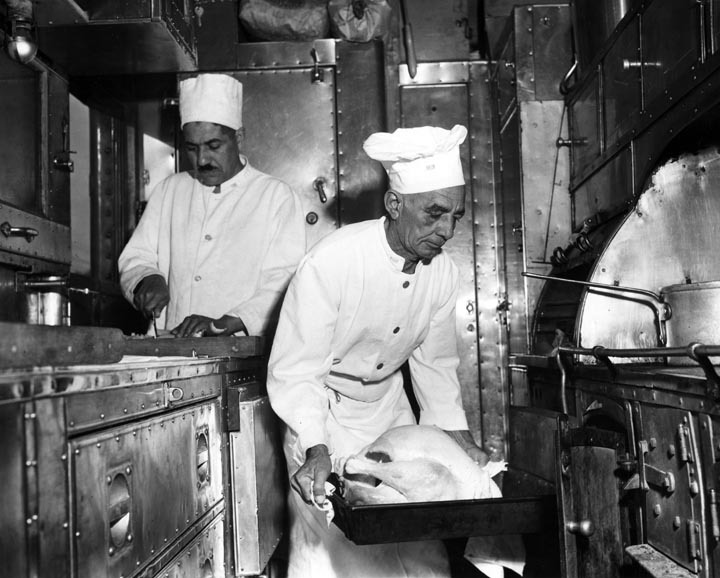 The hotel style car was equipped with a kitchen—the first passenger car designed exclusively for cooking and serving meals. 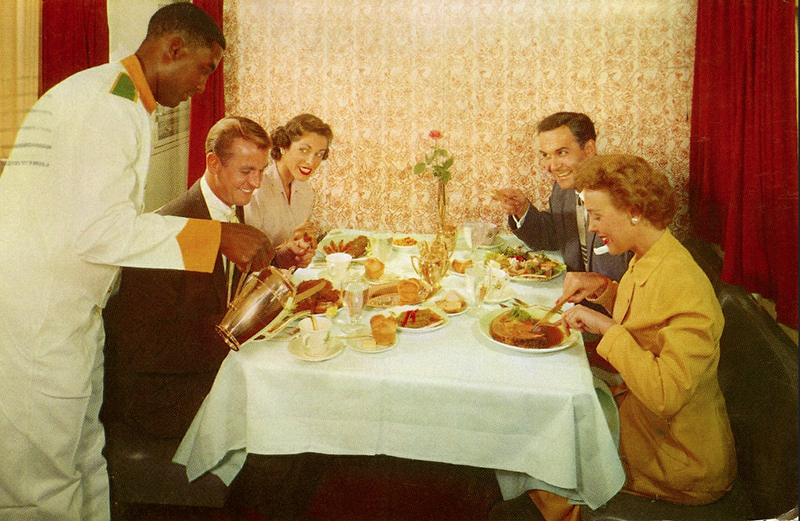 Dinner on the 20th Century Limited. 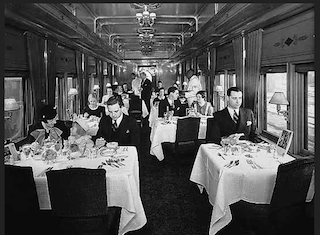 New York Central’s famed overnight train from New York to Chicago. 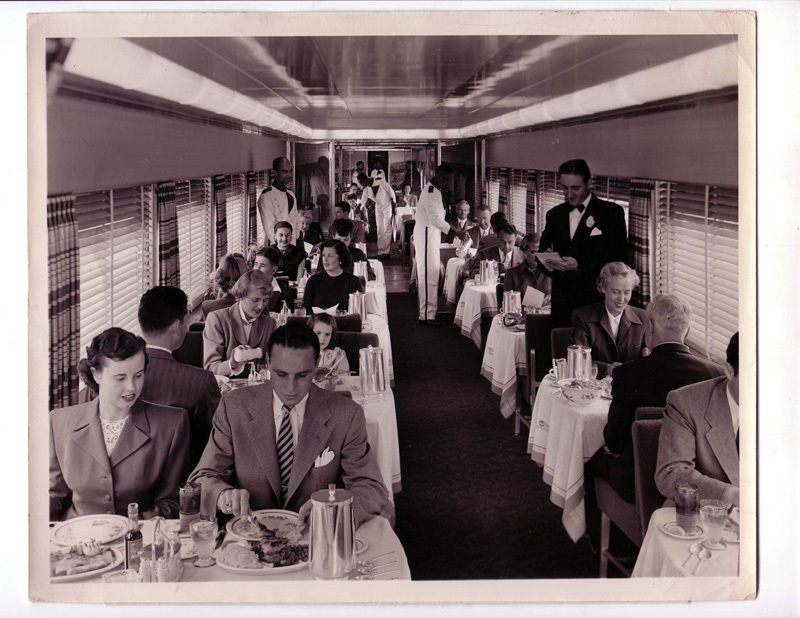 This car was very popular, and before many years had passed dining cars were in use on many railroads. 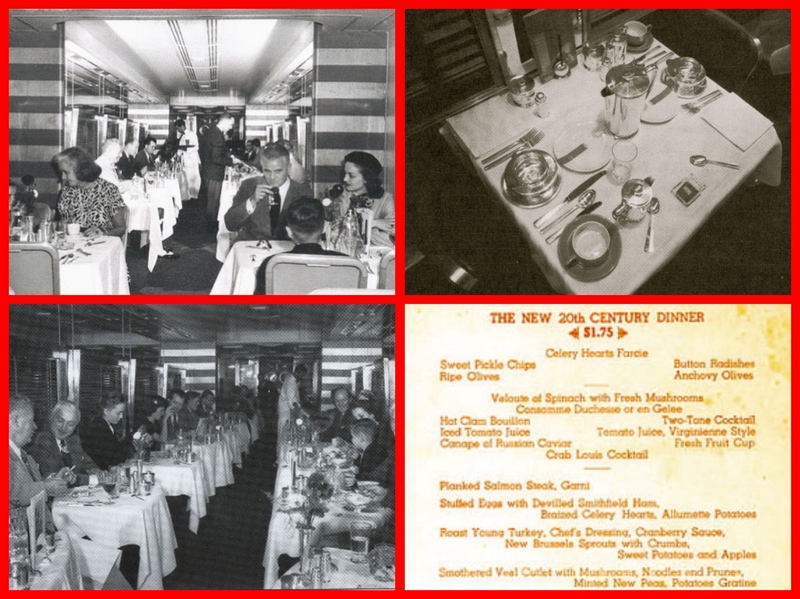 From the 1900s on (until Amtrak), hundreds of passenger trains in the United States carried dining cars, providing travelers with a wide variety of foods and as excellent service as may be obtained in a first-class hotel or restaurant. 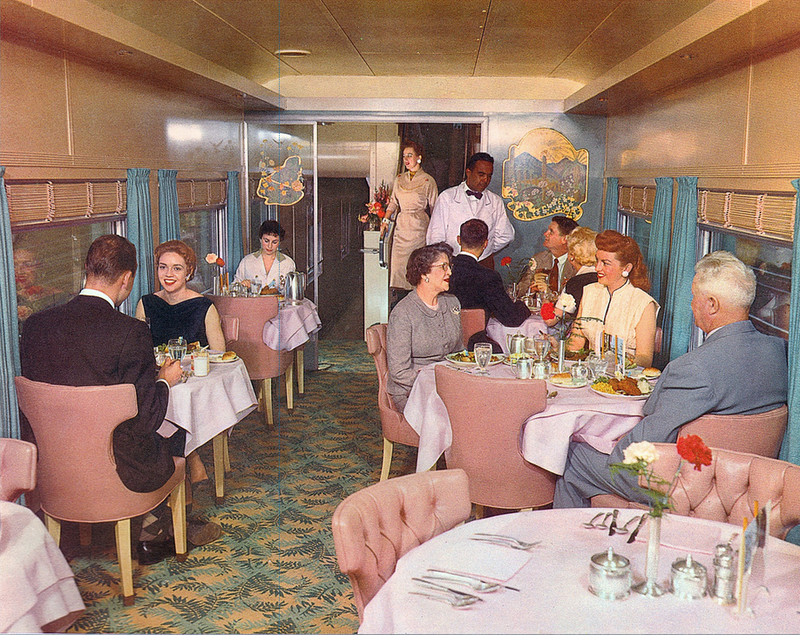 The interiors of the modern dining cars in the 1950s and 1960s were decorated in attractive style, many of them in gay pastel shades. Some have novel seating and table arrangements, including built-in lounge seats. Diffused lighting, colorful window drapes, and soft carpets suggest the friendly atmosphere of a neighborhood club or a home dining room. 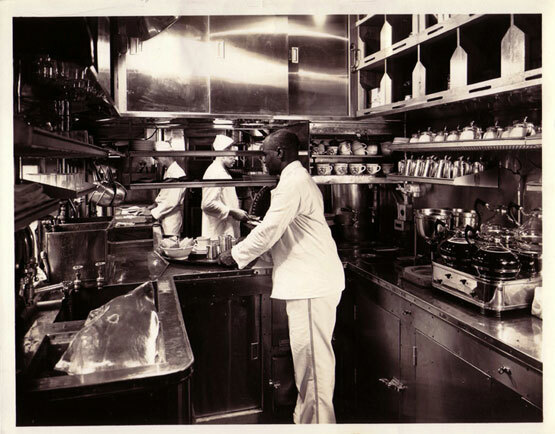 Kitchens aboard the dining car. Chefs and cooks at work. All the meals were prepared from scratch. Pies were baked aboard the trains. The best meat and fish were boarded enroute. Tables prepared with snow-white linen, gleaming silverware, and sparkling glasses give promise of an appetizing meal to come. 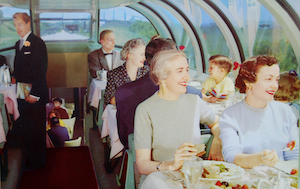 Air-conditioning has made dining on the train a greater pleasure than ever before. 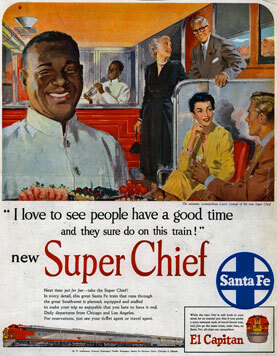 A 1950’s publicity film from the Santa Fe RailRoad about “the Super Chief” luxury passenger train which ran between Chicago, Illinois and Los Angeles, California. The film features Virginia Leith – 1950s film star. 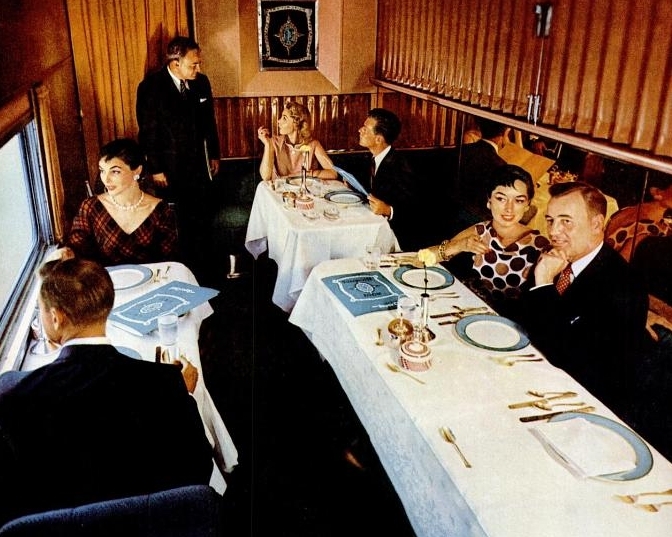 Dining car on the famed Santa Fe all-Pullman Super Chief in the Turquoise Room. This car was very popular with film stars – like Frank Sinatra, Elizabeth Taylor and Richard Burton for privacy. 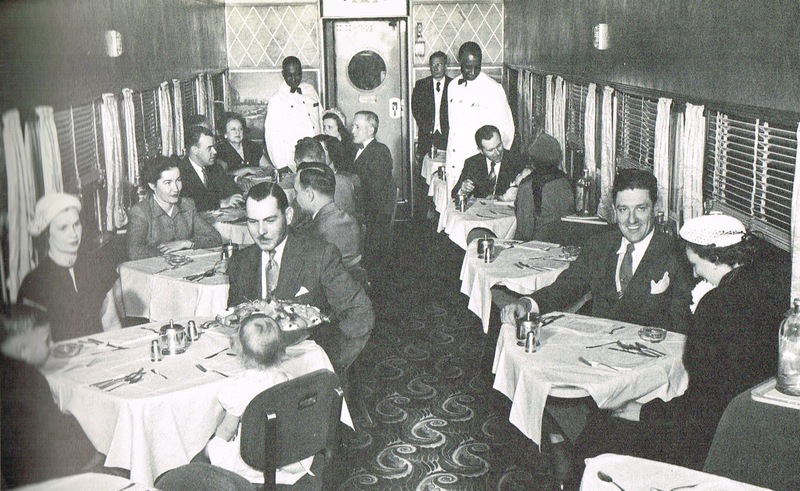 Patrons dine in the 1950s aboard a Baltimore and Ohio diner. 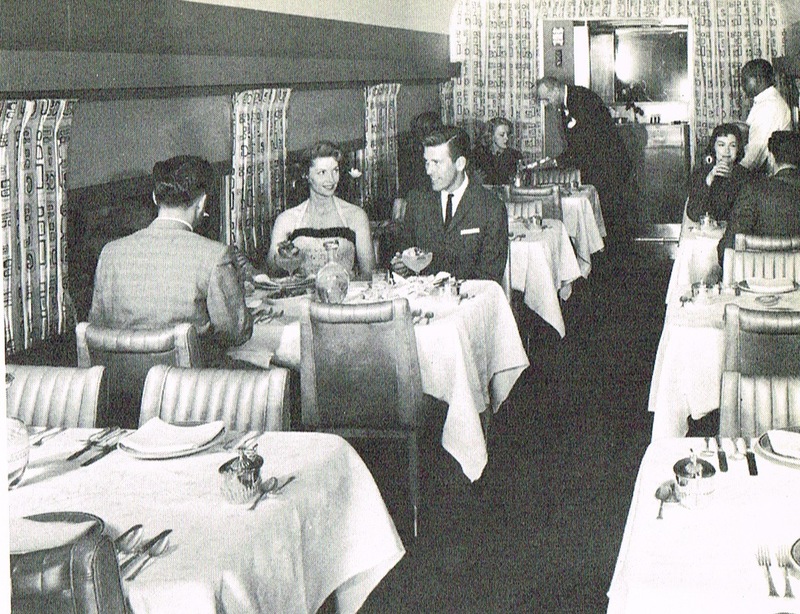 The dining-car steward greeted his guests at the door and ushered them to their tables. The white-coated waiters helped them in the selection of their meals from the menu. 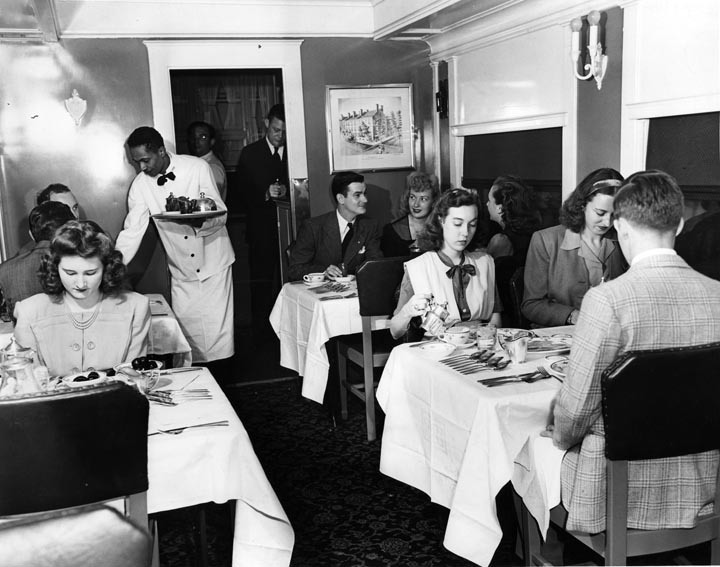 The passenger would write his order on the order blank (or check) place their orders with the chef, serve the dishes in delectable style and attend to the patrons’ every want. 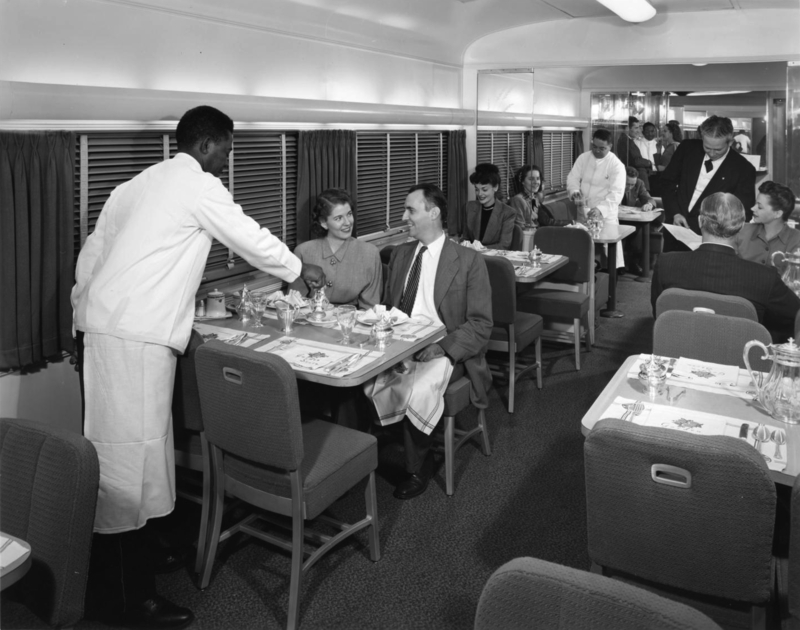 Coffee shop style dining cars were found on many all coach trains. 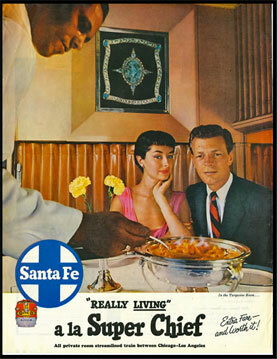 On some trains lunch-counter cars were operated. They specialized in light lunches or meals at popular prices. 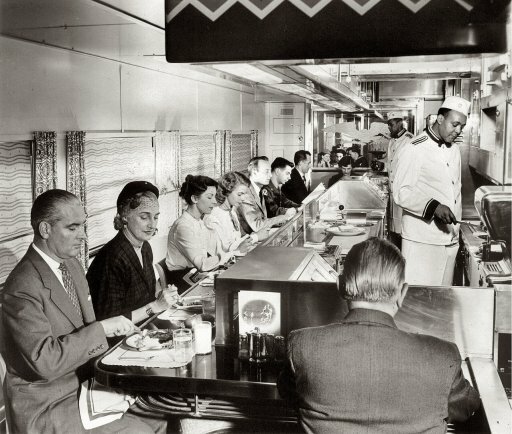 Some trains included grill cars, a combination of cafeteria and soda fountain. These cars were especially popular on overnight trains. 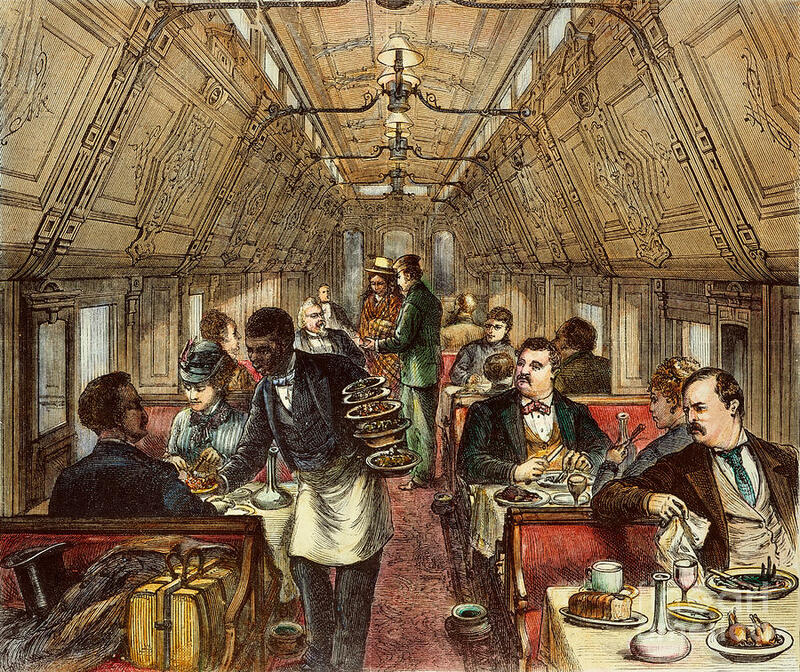 On many trains, tray service was provided, from the dining car direct to the passengers’ seats and private Pullman accommodations. When the passenger had finished his meal, the waiter brought the order check on which the steward had written the amount of the meal. The passenger paid the waiter, and the waiter turned the order blank and money over to the steward. 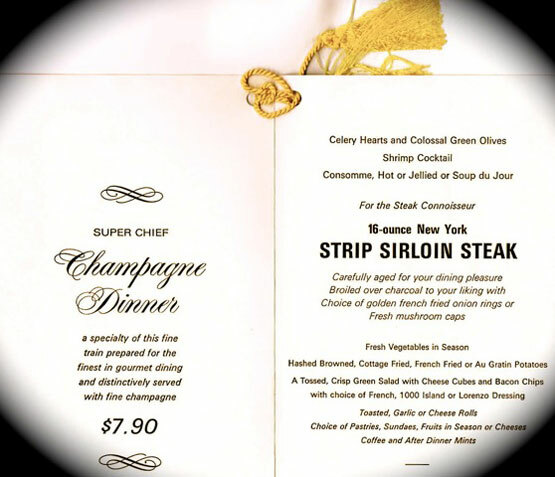 At the end of the run, the steward turned all order blanks and money over to the superintendent of dining car service or his assistant for forwarding to the treasurer. 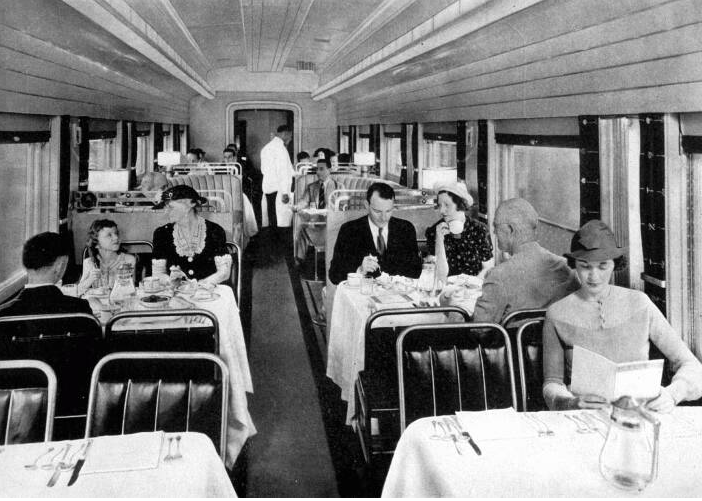 During the heyday of American passengers trains, railroads of the United States served nearly 25,000,000 meals to their patrons. 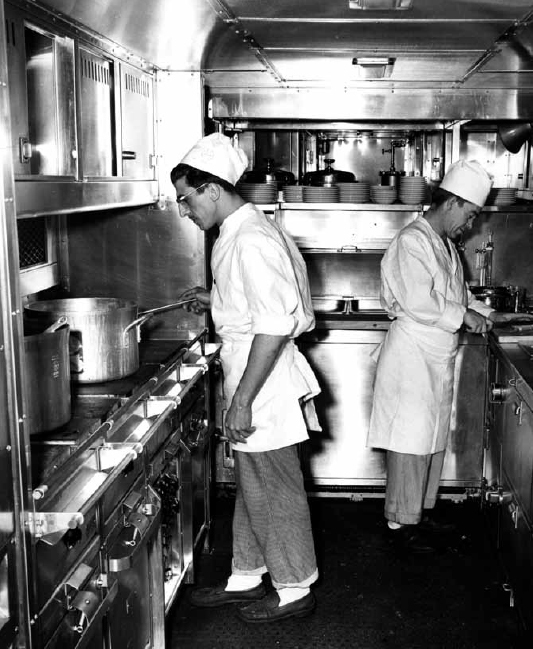 Dining car crews—stewards, chefs, cooks and waiters—were carefully selected. Each man must undergo a thorough physical examination before entering the service and at frequent intervals thereafter. 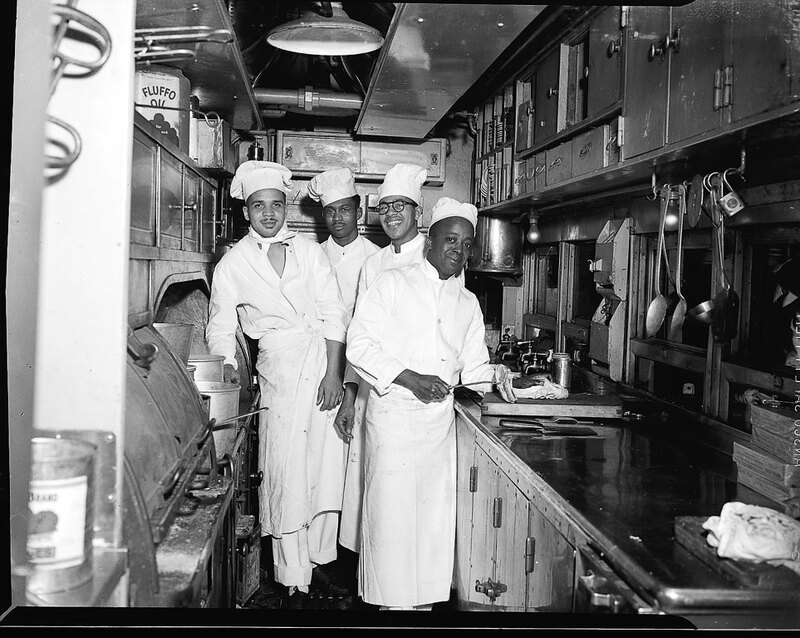 Newly employed cooks and waiters usually attended a school for dining car employees conducted by the railway company before they are allowed to go on the road. The school taught them their duties and responsibilities. They were instructed in such matters as courtesy and deportment. Only in this way were the railroads able to maintain their high standard of service. 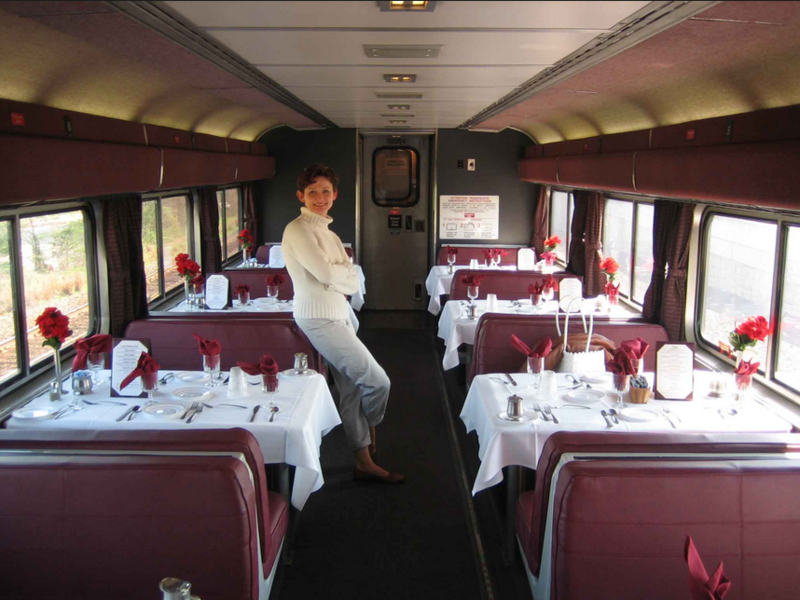 America’s rail system continues dining car service on many trains.